If you’re looking for a midsize sedan that can fit your whole crew with ease, you can stop here at the 2018 Volkswagen Passat. With spacious interior, the latest technology, and powerful engine options, the Passat has the best of all sedan features in one package. For our drivers in Lee’s Summit, North Town, and Olathe, our team at Volkswagen Lee's Summit has put together this review of the 2018 Passat, so that you can have all the information you’ll need in one place. Let’s get started by looking at the inside of this versatile ride. Inside the 2018 Volkswagen Passat, you’ll find high quality materials that line the cabin, such as available wood and aluminum trims. Leather seats are an option, as well, adding to the luxury feel the Passat radiates. Along with style, the Passat makes for the perfect family-friendly vehicle with its impressive passenger space—102 ft³ to be exact. And no matter how tall your little ones get, they’ll find plenty of legroom in the backseat, with 39.1 inches of space to stretch out. When it comes to technology, the Passat comes standard with an infotainment system via a 5-inch touchscreen display. You can connect your smartphone to access your music and apps (or, let’s face it—the kids’ music and apps) via Apple CarPlay™, Android Auto™, or MirrorLink®. With two powerful engine options, you’ll put some pizzazz to your daily drives. The 2018 Passat comes standard with a 2.0L turbocharged engine that produces 174 horsepower and 184 lb-ft of torque, so you’ll be zipping from the grocery store to soccer practice and back. If that’s not enough, opt for the 3.6L V6 that puts out a massive 280 horsepower and 258 lb-ft of torque. Either way, you’re looking at impressive power with both options. But don’t think you have to give up fuel efficiency for an extra engine boost. 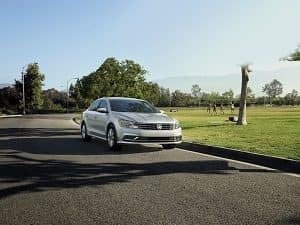 The Passat achieves an EPA-estimated 25 city/36 highway MPG with the base engine; if you’re going for the V6, these numbers don’t drop much, with an EPA-estimated 19 city/28 highway MPG. So, you’ll be cruising on by the fuel pump en route to your next family vacation spot. Your family sedan should have you feeling extra secure on the road, and the Passat does just that. The National Highway Traffic Safety Administration even gave it a 5-Star Overall Safety Rating, its highest score, proving that it’s the right option to keep you and your loved ones safe. When you have options like these, you’ll feel like you have an extra set of eyes while on the road, and get to your destinations with a little less worry. Test Drive the 2018 Volkswagen Passat Today! If you are in the areas of Lee’s Summit, North Town, Overland Park, Mission, or Olathe, stop by Volkswagen Lee's Summit to see for yourself what the 2018 Volkswagen Passat has going on!